The blue text on the chart and the events indicated by dots on the line are hyperlinked - just click them. Note: WWII refers to US participation, 8 Dec 41 - 15 Aug 45. Do you think these are just "numbers"? Think again. They are real people. 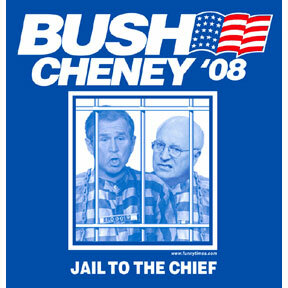 See this page or this page for the information Bush, Cheney, and Rumsfeld don't want you to know about our casualties. 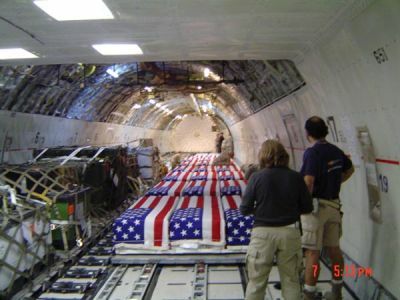 and George W. Bush hasn't attended ONE of their funerals. 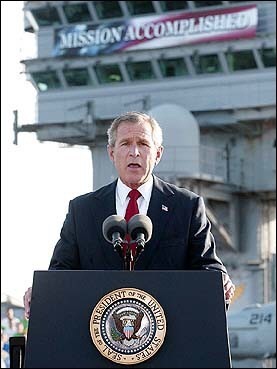 Rest in peace knowing you gave your lives for oil and Halliburton's balance sheet. 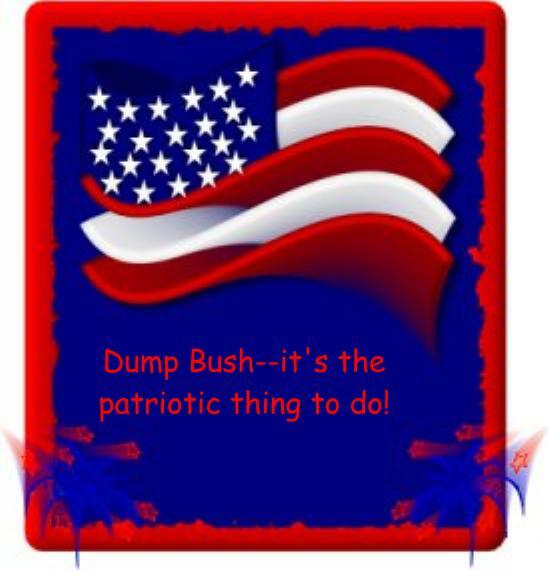 To paraphrase our late unlamented leader, Ronald Reagan, "It's mourning in America again." Also see the gallery of similar pictures here. It's a sobering group of photographs. You can at the above site select just your state, or selected counties or cities within that state. It brings it home to me to see what my state or a nearby community has spent. For instance, Battle Creek, Michigan is one of the closest cities to me which is shown, and the cost there is enough to build several hundred homes for those who need them worst, or provide medical care to thousands of people. 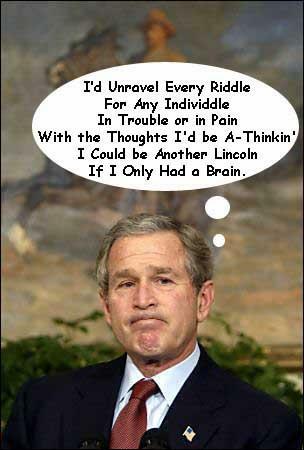 George W. Bush has conveniently forgotten the verse in Matthew 25:40 which says: "Verily I say unto you, Inasmuch as ye have done it unto one of the least of these my brethren, ye have done it unto me." By denying housing or medical care to those who really need it, he has denied it to Jesus himself. See this blog post for a related thought on this verse. 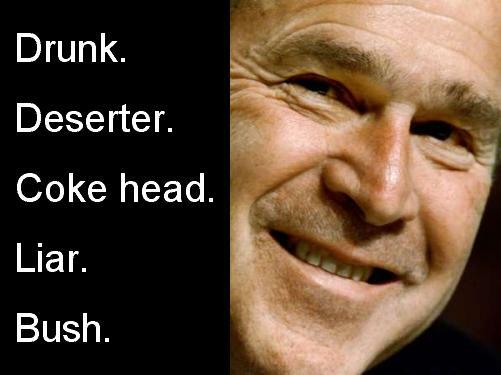 OK, the Sunday morning sermon is over, you may now go back to browsing my Bush tribute page! How long until Der Füehrer Büsh is gone? which proves there can be too much of a good thing." 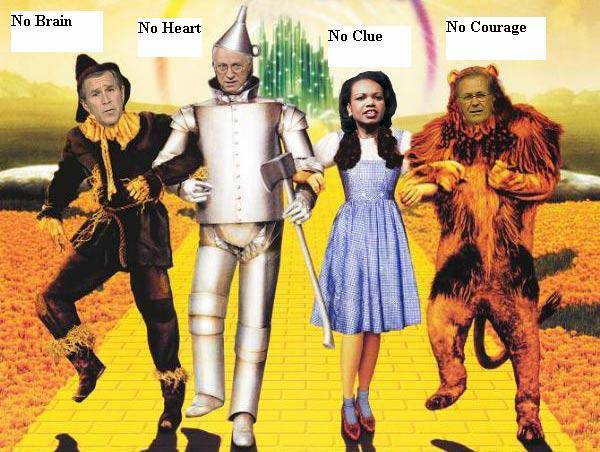 Did you ever wonder "what if" about Bushco and The Wizard of Oz? 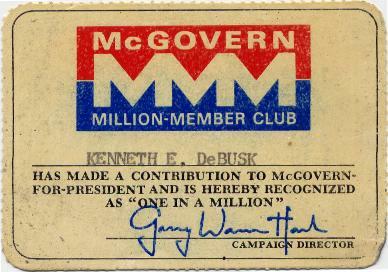 I first registered to vote in 1971, and in 1972 I joined the club with the card shown below. George McGovern was running against Richard Nixon, whom I despised at a politician, and I spent almost half my weekly salary to send the campaign $25. The theory was that if one million people each sent $25, Senator McGovern would have a war chest about as large as Nixon's and could contest the election. History proved him wrong on that, but history proved Nixon more wrong on bigger things. Ah, the wonderful memories of John Dean and Sam Ervin and the Watergate hearings! I still have the lapel pin also, and I have seen the pin/card package for sale on the web for $25. Not counting the value of inflated money since then, I could sell them for what I paid for them. But I won't! I was the first registered voter in my county in the 18-20 year old class after the 26th Constitutional Amendment allowing my age group to vote. I was issued card number 1-NE. The "NE" stood for "national elections" since the state interpreted that amendment as applying to federal elections only. That was later changed. I wish I still had that card, but had to turn it in when I turned 21 to get my "regular" card issued to me. It would have made a souvenir almost as nice as my treasured MMM card. 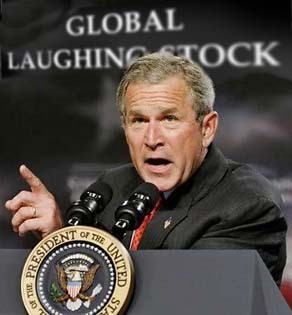 For an amusing audio take on religion and politics, click here. 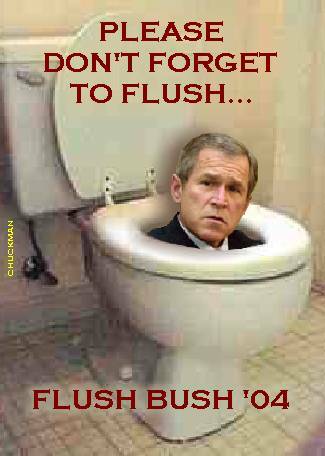 For an address by Dubya on global warming, click here. Love your country. Never trust its government. 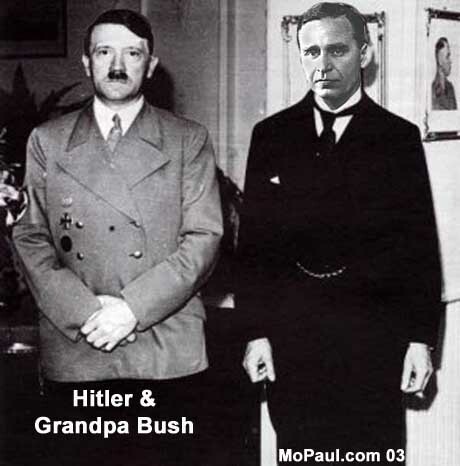 Click here to read a well-documented story about Prescott Bush (above with Hitler) and his dealings with the Nazis. 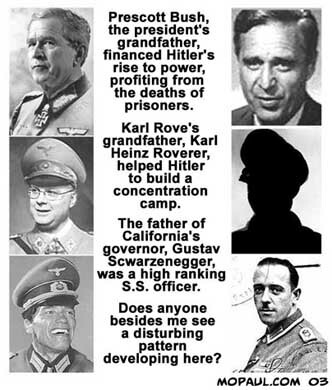 It will make you think twice about the entire Bush dynasty. REGISTER TO VOTE! Click the icon for mail-in form. If you have bad comments, remember what your mother taught you : "If you can't say something good, don't say anything." If you have good comments or suggestions, email me here. Site made using Mozilla Composer 1.5 and SeaMonkey 1.1.6 by Ken with initial help from my dear departed friend Brian. Rest in peace, my friend. Last updated 2007-Nov-24 (as if anyone really cares except me). 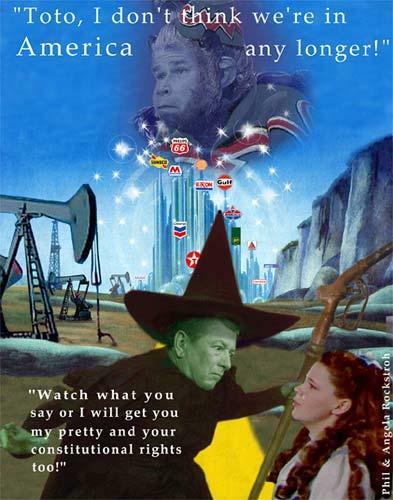 One warning I will give you--you see some graphics on here which have the URL "MoPaul.com" on them. I saved those many years ago. If you go to that URL now, you will find that someone else owns that domain now, and it has absolutely nothing at all to do with Bush or politics. You have been warned! !